All our implant abutment and crowns come with a 5-year guarantee on the frame work and 3 years on the ceramics. Because of the complexity of implant cases, we ask clients to allow three weeks between appointments. This list contains the implant companies used most frequently. If the company you use is not included here, please get in touch to discuss your specific requirements. For more complicated cases involving many components and stages, please ask us for a full quote. 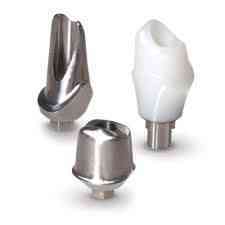 We can provide a number of different restoration options and can also calculate all the required implant components. Once the product and process for a case has been selected, the try in stages and time scale required are calculated and we then work together with our dentists to decide on appointments.